A teenage boy has been stabbed to death by a group of men who chased him and then attacked him in west London. 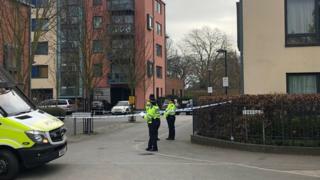 The men pulled up in a vehicle near Syon Park, Isleworth, and chased the 17-year-old boy before catching up with him and stabbing him, police said. The boy, who had been with a group of other people, was found injured outside a block of flats in Union Lane at about 22:35 GMT on Friday. Officers gave first aid but he died at the scene. No-one has been arrested. The Metropolitan Police has started a murder investigation but officers said they were "keeping an open mind" about a motive. Post-mortem tests and a formal identification are due to be held later. A section 60 order, granting police increased stop and search powers across the area, is in place. A couple who called the police said there was "blood everywhere". The 35-year-old woman, who did not want to be identified, said the teenager was still alive when she and her husband saw him. "There was someone else there trying to help by checking his pulse. He was responding but he couldn't speak," she said. A second witness said the teenager was assaulted by two people, one wearing a mask. "It was one guy who was massive with a mask on his face and another small guy. They were kicking him, but it was dark so it was hard to see exactly what was happening." Halima Abubaker, 22, said she saw two males "running for their lives" around the time of the incident. She said: "I just heard loads of people, then there was seven police cars and two vans." Mayor of London, Sadiq Khan, described the teenager's death as "heartbreaking". "This is a 17-year-old boy who has lost his life because of a knife attack," he said. "My thoughts and prayers, as I'm sure are those of all Londoners, are with his family." There have been 28 deaths classed as "homicides" in London this year.